An update to the cockpit software that could have contributed to the deadly Ethiopian Airlines crash last week was delayed partially because of the 35-day government shutdown earlier this year. Federal Aviation Administration officials told The Wall Street Journal on Tuesday that a software problem with the Boeing 737 Max's MCAS flight-control feature was expected in January, but that the shutdown "halted work on the fix for five weeks." The agency did not label the software fix an imminent concern, according to the Journal, and thus deemed the delay acceptable. Boeing promised a fix by April to the software and said it is working "closely with the FAA" on certification of the software "enhancement." The FAA released a statement on Tuesday–with news of the aircraft's grounding by Canada, China, Indonesia, Singapore, the European Union and more than 30 other national aviation authorities–saying that the plane is safe to fly. "Our review shows no systemic performance issues and provides no basis to order grounding the aircraft," the release from acting FAA Administrator Daniel K. Elwell reads. But on Wednesday afternoon, the Trump administration announced it would ground the planes in the United States as well. The FAA has been operating under an acting administrator for 14 months and the budget for the Transportation Department has decreased during President Donald Trump's administration. All 157 passengers and crew members on Ethiopian Airlines Flight 302 died when the plane went down Sunday shortly after takeoff from Bole International Airport in Addis Ababa. Another Boeing 737 Max 8 plane running on the MCAS flight-control software crashed in Indonesia last fall and investigations into the cause of the October crash are still ongoing. Similarities between the crashes have prompted the grounding of the planes in many countries. According to the Journal, the safety certification record of the 737 Max is partially derived from certification history of the Boeing 737 Next Generation, potentially obscuring the plane's safety record. 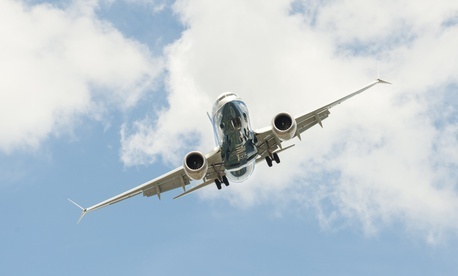 Since the 737 MAX is a derivative of an earlier model, certification rules allowed regulators to give the plane maker credit for the safety record of those earlier planes. And to some extent, government and industry officials have said, government scrutiny of certain systems typically is less intense for derivatives than for brand-new designs. With design work on the original 737 planes dating back some five decades, “there is no other jet in the world that has so many derivatives over such a long period of time,” according to John Cox, an industry consultant and former senior safety official for North America’s largest pilots union. In the wake of the weekend crash, President Donald Trump tweeted his thoughts on automation software used by the aviation industry. According to reports, Boeing CEO Dennis Muilenburg spoke to Trump Tuesday after the tweets, assuring him of the safety of the plane. A Boeing spokesman told CNN that Muilenburg reiterated to Trump that Boeing believes that the 737 Max is safe. FlyersRights, a passenger rights organization, called on the FAA to ground the planes. In a statement, the group said "Serious questions over Boeing’s MCAS system safety need answers and a re-certification of this aircraft." The group's president, Paul Hudson, said the FAA keeping the planes in the air "risks lives as well as the safety reputation of the U.S. aviation industry." Hudson, a member of the FAA Aviation Rulemaking Advisory Committee, also said that "the failure to warn airlines and pilots of the new feature, and the inadequacy of training requirements" should be reason enough to ground the plane. The largest flight attendants union in the United States also called on the FAA to ground the 737 Max. "This is about public confidence in the safety of air travel," Sara Nelson, the president of Association of Flight Attendants-CWA, said in a statement. "The FAA must restore public confidence by grounding the 737 MAX until the required changes have been implemented and the public can be fully assured." By Wednesday afternoon, the mounting pressure on the government and Boeing forced the issue to a head and President Trump ordered the fleet grounded. "I felt it was important psychologically and in a lot of other ways," Trump said. He stressed that the decision was made out of an abundance of caution. During the shutdown, a group of aviation workers' unions warned of catastrophic effects on the American aviation system. The National Air Traffic Controllers Association, the Association of Flight Attendants-CWA and the Air Line Pilots Association released a joint statement saying that it was impossible "even calculate the level of risk" during the shutdown due to a halt of inspections, furloughs to safety workers and federal aviation employees working without pay. Former Transportation Secretary Ray LaHood and Jim Hall, who headed the National Transportation Safety Board from 1994 to 2001, also called on the FAA to ground the 737 Max this week. The Senate Commerce, Science and Transportation Committee will hold a hearing on American air safety in the wake of the crash, committee chairman Sen. Roger Wicker, R-Miss., announced on Tuesday. "It is important to allow the FAA, NTSB and other agencies to conduct thorough investigations to ensure they have as much information as possible to make informed decisions," he said in a statement. He also told reporters that he would personally fly on the 737 Max. Sen. Lindsey Graham, R-S.C., had earlier backed the FAA's decision to keep the plane flying. "I'll let the FAA make that decision," Graham, whose state houses a large Boeing plant that makes parts for the 737 Max, told reporters Tuesday. "I trust their judgment until somebody proves that I shouldn't." Several senators had called on the FAA to ground the plane prior to Trump's decision, including Sens. Mitt Romney, Elizabeth Warren, Ted Cruz, Richard Blumenthal and Dianne Feinstein. "There should be a full investigation but in the meantime, better safe than sorry," Blumenthal said. This story has been updated to reflect President Trump's order to ground the fleet Wednesday afternoon.